As plans were announced last week for a new British civil space strategy, a firm unveiled ideas for what could be the UK's first mission to the Moon. At last, Britain's space race seems to be hitting its stride. It brings an annual £4.8bn turnover to British industry. Science Minister Malcolm Wicks calls it "the great adventure of the coming millennium", and it starts 100km from wherever you read this - straight up. Space, it turns out, is an unheralded "national success story". The minister has announced a new government consultation on future space strategy, emphasising it as a way to arouse schoolchildren's enthusiasm for science. Meanwhile, one leading space company is pitching to shoot for the Moon, having unveiled concepts for UK-built lunar missions. While the UK has traditionally shrunk from the spotlight when it comes to the flashier aspects of the final frontier - hardly helped by the loss of British-made Mars probe Beagle 2 in December 2003 - this modesty tends to conceal the fact that it is a key player in space sectors. From a business park near Guildford, ground controllers keep watch on the changing face of our planet with a flotilla of five satellites called the Disaster Monitoring Constellation (DMC). In true Thunderbirds style, their images have guided emergency responses to disasters such as the Asian tsunami and Hurricane Katrina. They also deliver continually updated environmental information to governments and customers. The US and European space agencies have comparable monitoring programmes, but they use satellites typically as large as double-decker buses, whereas the DMC are the size of washing machines. The world's leading small satellite manufacturer, Surrey Satellite Technology (SSTL), constructed each micro-satellite for a different government - the UK, Algeria, China, Nigeria and Turkey (with Spain in line to purchase its own). However, by working together they provide 24-hour coverage of the entire Earth's surface - something no single large satellite can match. "It's almost like buying a hi-fi; you can either get it as one expensive unit or as separates," says Philip Davies of SSTL. "Our satellites carry only one or two instruments compared to the 10 to 20 on larger satellites, but because they are smaller they are quicker and cheaper to build. "And our working speed means we can use the latest electronic components available, so our satellites benefit from the ongoing increase in their efficiency." SSTL has built and flown 26 satellites for a wide variety of purposes, with eight more in development. Originally a spin-off from the University of Surrey, the 200-strong company's most high-profile customers include the US Air Force and Esa, for whom it built the initial test satellite for Galileo, Europe's answer to the US's GPS navigation system. Now SSTL has begun to look beyond Earth's orbit, as UK astronomy funding body PPARC wanted to see what use could be made of small spacecraft in deep space. The result, announced last week, is Moonlite and Moonraker. "The first mission involves hitting the Moon at high speed with penetrators while its follow-up is a lunar lander," explains Mr Davies. The plan would be to study differing conditions from the equator to the shadowy - and possibly ice-bearing - lunar poles. Comparisons with the doomed Beagle 2 leave him undaunted: "It's a shame it didn't work, but it was always a very ambitious goal to land on Mars: it has an atmosphere you need to get through with a heat shield, and is so distant from Earth that remote control is impossible. "In a lot of ways, the Moon is a much easier target." A 2010 launch of a lunar mission might cost £60m - the price of a medium-budget Hollywood blockbuster - which is cheap enough for the UK to fund by itself, or at least lead within the European Space Agency (Esa). 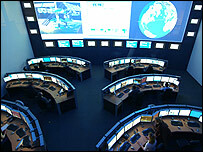 The Mullard Space Science Lab is the UK's largest university space research group. 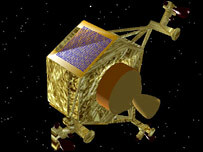 Part of University College London, it worked with SSTL on developing the penetrator mission. The lab's Dr Andrew Coates says they would like to work with nearby SSTL on the follow-up lunar lander. Mullard contributes instrumentation for space missions, including international probes to Venus, Mars and Saturn - activity that keeps the UK punching above its financial weight in the space science field. "We and the other universities do well in terms of proposing new ideas for instruments and missions," Dr Coates adds. "However, national funds are needed to support these concepts - and they are not always there." In terms of self-supporting activities, the UK space industry's dominant sector is actually satellite communications, especially direct-to-home satellite broadcasting. The UK is also home to one of the world's leading satellite phone companies - Inmarsat, based in London's fashionable Old Street. It has become the satellite communications brand of choice for everyone from round-the-world yachtsmen to Air Force One - Osama Bin Laden was also a devotee until the mid-1990s. A new generation of satellites built in the south of England now provides broadband services across much of the planet, enabling videophone reports seen from remote trouble-spots on TV news. Underscoring the importance of government strategy, the technology was developed through UK investment in an Esa research programme, estimated to have paid itself back to the Treasury 40-fold. When it comes to putting people rather than satellites into space, the British National Space Centre (BNSC) has always declined to invest funds into this area, so industrial activity is correspondingly slight. There are exceptions however: two British firms have got to write the book on Europe's most ambitious ever manned spaceflight project - the instruction book, that is. 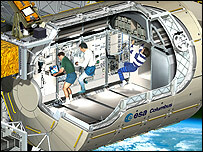 Due to be attached to the International Space Station in 2007 is the Columbus Orbital Facility, a two-decades-in-the-making lab crammed with scientific equipment, environmental control and life support systems. A Letchworth-based project management company was one of those given the task of converting Columbus engineering information into an operations manual. It can be used on the ground and by the astronauts and comes in an electronic version. But Ian Schofield, of Time Is Ltd, sees a problem with the system in the UK, compared with its international counterparts: "When you compare it to the way France, Germany or America works with their space industry, the support just isn't there. "You can't imagine contracts for a French government space project, for instance, getting outsourced to the cheapest foreign bidder, as it is here." Fantastic, yet more of the taxpayers money we can waste on nothing in particular. I wonder exactly what we'll get in return - kudos from saying we were there 12th? Some bits of rock worth £20bn that the Americans got in 1969? Let's stop wasting public money on "feel good projects" and invest it in making the Tube cost less. It's been well known for a long time that Britain is world class when it comes to engineering and technology, but as mentioned, we need the support. We need to be able to prove our ability by producing the work here. The more exposure we have, the greater our successes will be. It would be nice to advertise to the rest of the world that we are actually good at something. NOT investing in space is the best thing the government could have done! On it's own the UK space industry has developed into a lean, agile, and above all profitable enterprise. Public sector involvement is the kiss of death. Go Britain! I own a small engineering consultancy that designs hardware for satellites and is also working on the development of technology for a spaceplane. I am so impressed with the UK government's support for the UK space industry that I am off to France to scout out somewhere to relocate to. Be under no illusion, Napoleon was right - we are a nation of shopkeepers. Given the urgency of global warming - and that each launch of the space shuttle produces more CO2 emissions than the entire car exhaust output of the US in a whole year - launches into space should be done only when absolutely necessary. What a load of chauvinistic nonsense. The exploration of space and other worlds is the ideal candidate for international cooperation not xenophobic flag-waving. And, as Bush's Nasa plans have shown, the ridiculously expensive drive to put humans in space simply drives funds away from worthier and more productive projects like the upgrade of the Hubble telescope. Lets go! company sponsors could help raise the £60m it could help slowing interest in UK engineering and manufacturing. With the government trying to encourage the study of science and engineering why isn't this bigger news? When I first got interested in science back in the 70s I was only a young kid, stories like this were the sort of thing that inspired me. As a result I spent 7+ years studying science and engineering in the 90s. Surely if kids these days need encouragement this is the sort of "BIG" science that they should be exposed to? Britain will only be recognized for its achievements when it has an independent, efficient and transparent Space Agency worthy of the name, independent from government interference and "wavering enthusiasm". Britain's space race hitting its stride? Hardly. More like stumbling to catch up. Our shameful lack of participation in the International Space Station sums it all up really. And before anyone points to UK astronauts, bear in mind there is no such thing, only British-born, American-trained astronauts. We have the 4th largest economy in the world and a real expertise of talent in the areas of space science. Having a national human spaceflight programme has been long proven by Nasa and ESA that it is good for the country, in terms of investment and technology in the space industry, but most importantly, the inspiration it gives to young people to motivate them about science, engineering and aerospace - something which our country desperately lacks. A poll run by the BBC last year suggested that 2/3s of readers support the decision to send Britons in space. Surely if taxpayers are willing to fund human space activities, our government should listen? Where does it leave our dreams if we don't follow in the quest of humanity's greatest adventure? Mark, we have the 6th largest economy in the world. The private space sector are true unsung heroes. They receive very little support, bearing in mind that ours is the only government to abandon its ability to reach orbit. Our rocket was called the Black Arrow and was abandoned because the government 'could not see a future in satellites'. We have a plethora of companies, from SSTL offering satellite design and construction, to Starchaser Industries, who are working on manned space flight. In fact, only nine years after founding the company, they launched the most powerful rocket in UK history!